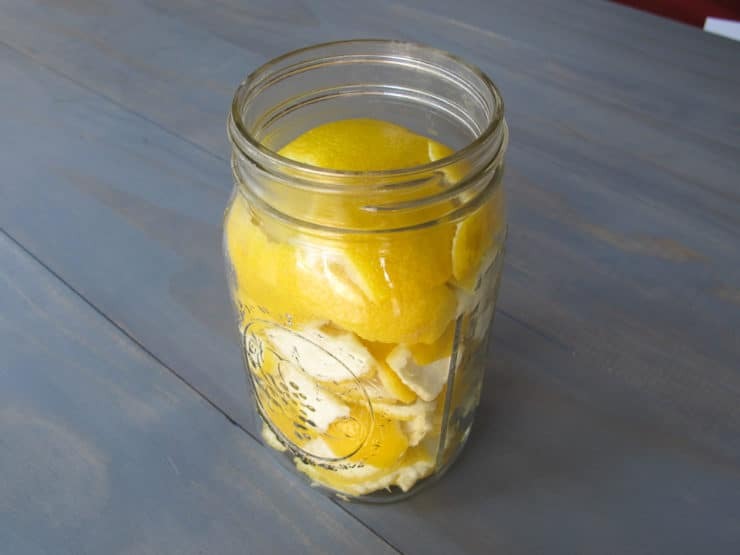 I have been making my own homemade all-natural citrus cleanser for a while now. I thought it might be helpful to share a tutorial on how I make it, in case you’re working to “clean up your act” in the same way I am. 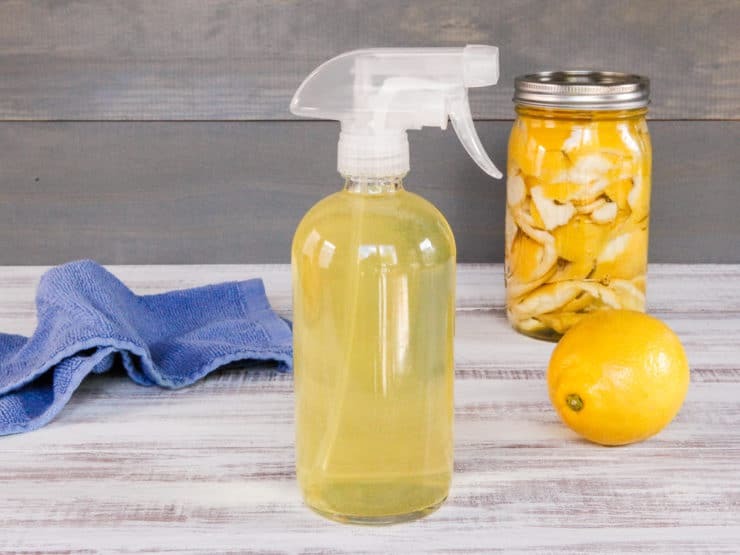 In this post, you will learn how to make your own organic citrus-infused liquid cleanser for kitchen, windows and more. It’s economical, natural and effective. Ditch your chemical cleaning products for good! As I mentioned in a previous post, lately I’ve been bitten by the cleaning bug. I’ve been emptying closets, re-organizing and eliminating clutter, shedding the old to make way for the new. I was also recently diagnosed with a thyroid disorder, which is really not a big deal but it has changed the way I look at my environment. My doctor described the thyroid like a sponge that takes in everything you’re exposed to, for better or for worse. I’ve decided that getting rid of unnecessary chemicals in our home is a priority. Making a homemade, all natural, all purpose cleanser is really quite simple. All it takes is some good old fashioned white vinegar, some citrus peels, and a little time. You can make it organic by using organic ingredients. This concept goes back to our great grandparents, who were using simple vinegar to clean and disinfect their kitchens and homes. More and more, I find myself returning to those old fashioned simple techniques… they’re often a vast improvement over the “modern” methods!. What I really love is how adaptable this “recipe” is. 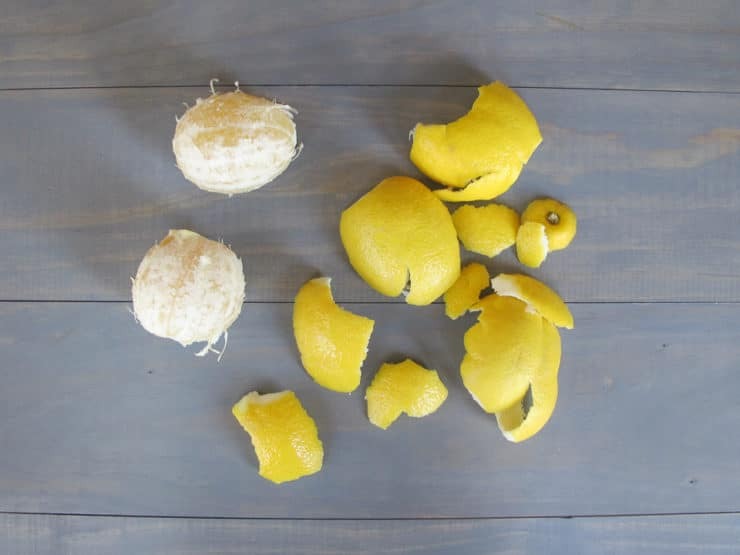 You can use any citrus peels you like – lemons, limes, oranges and grapefruit, or a combination of all of them! You can also make as much or as little as you like. They all work well, cut through grease, clean glass windows with very little streaking, and they leave your home disinfected while smelling crisp and clean. I like using these glass spray bottles to store them in. Of course you can use simple plastic spray bottles, which are less prone to breakage. The glass just feels more old fashioned to me, and I like the weight of it. Once you begin using this homemade cleanser instead of chemical cleansers you’ll start to realize just how unnecessarily potent the other stuff is. I can’t even handle the smell of chemical cleansers anymore. This one smells fresh, clean and is every bit as effective. Our great grandparents knew what they were doing. Hope you enjoy it as much as I do! Helpful Hint: If you’re wondering what to do with all of that extra citrus that has been peeled, try my Sweet Citrus Rosemary Medley, Citrus Avocado Salad with Poppy Seed Dressing or Pineapple Lime Grilled Chicken. 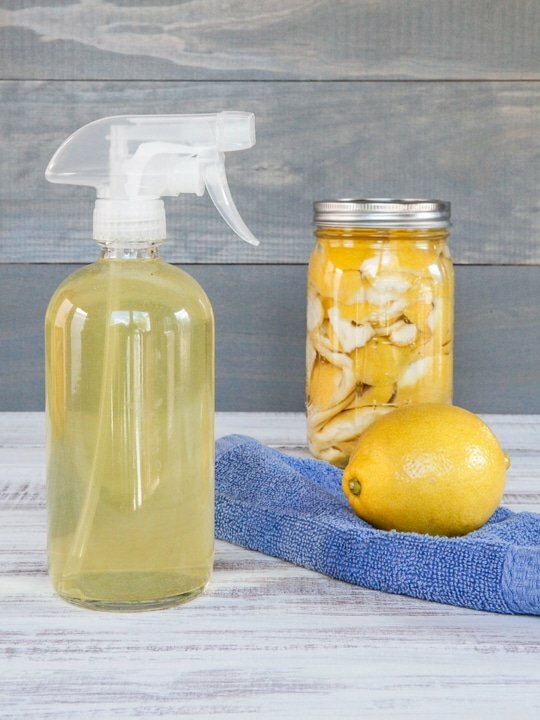 Make your own citrus-infused organic liquid cleanser for kitchen, windows and more! Economical, natural and effective. Ditch chemical cleaning products for good! Can you do anything with the peels instead of throwing them away? If there is mold, will that be ok? How do you know if you have distilled water or purified water? Is there a cleanser that could work on any surface and be pet safe? Thank you. I do not know of a use for the peels. I do not recommend using if the peels became moldy. Distilled water can be purchased by the gallon in most grocery stores, if you are uncertain you can purchase it. This cleanser should be pet safe, it is all natural ingredients. A little late commenting, but this mixture works great if your cat makes a ‘mishap’ in your house. It not only cleans the area, but the citrus deters your feline from returning to that same spot. Please test it in an inconspicuous area, if using on carpets, I have never had an issue, but that could be dependent on the type of carpet. Good to know about this Della! I tried doing this since our family drinks lemon water everyday. I leave our peels in a jar in the fridge but have found that they get moldy before the jar is completely full. Do you have any tips to prevent this from happening? Hi Harriet, you can freeze them in the freezer until ready to use. Does the water have to be distilled or can you use boiled or tap water? Hi Nadia, Tori’s assistant Ashley here. I have not heard of this method and we haven’t tried it, so unfortunately I’m not sure how it would turn out. 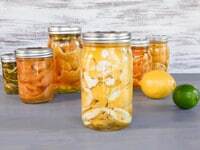 Hi was wondering if i could strain out the peels and replace with new orange peels to the infused orange vinegar and infuse for another 2 weeks? Will that make the smell of orange stronger ? Hi Santa, Tori’s assistant Ashley here. In my experience, two weeks is enough time to make a pretty fragrant cleanser. If you’d like to strain them and add new peels, I don’t see why there would be an issue, as long as no mold forms. I would like to know. Can you use the whole lemon for this cleanser? Or only the peels? Hi ILze, Tori’s assistant Ashley here. Only the peels should be used for this cleanser. I am wondering what happens if you happen to have some of the fruit on the rind and if it’s been longer than a couple of weeks after making the mixture. Hi Jeannie, Tori’s assistant Ashley here. There should not be any fruit left on the rind when you make this cleanser. I did not get the mix from you; however I made a batch and yes it works very well. Forget those over priced commercial products and I use it neat which really, really cleans. Hi Michelle, Tori’s assistant Ashley here. It’s best to use all of the peel if you can, not just the zest. You can also use a knife to remove the peel, just be sure there isn’t any fruit attached. LOVE LOVE LOVE this recipe and cleaner. Use it all the time and have introduced as many people to it as possible. I put a couple drops of thieves essential oil in my spray bottle with thus mixture and use it for woods, tile and my windows. Or just to freshen the air!! Great for use around kid’s which helps alot for children with allergies. So earth friendly and cheap! What would happen if you used regular purified water instead of distilled water? Sorry if this is a dumb question. Hi Laurie, Tori’s assistant Ashley here. For this cleanser it is important to use distilled water. It keeps much longer than if you were to use purified water. 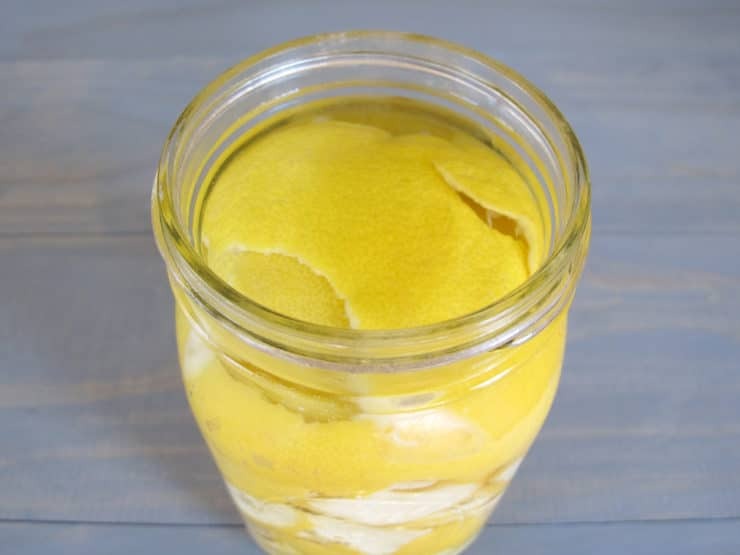 If you are using the process above, you can use any mixture of citrus peels you like. Hi. I was wondering if you can tell me what the shelf life of this is since you’re not adding any preservatives? Thank you. Hi Linda, vinegar is a powerful natural preservative. It should last for quite some time. I’ve never had a batch go bad. I will definitely try this next summer. I’m a big fan of infusions, and cleaning with natural products. Now I can make my own, thanks! 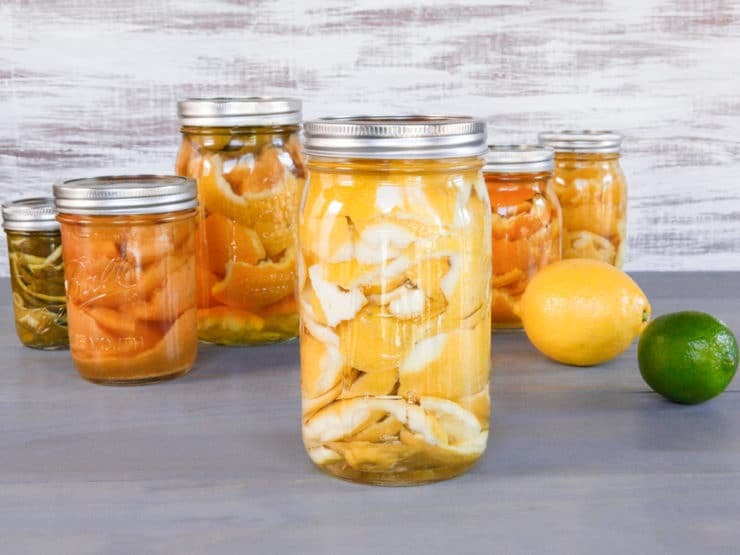 Do you think that saving small amounts of citrus peelings in the freezer (until there’s enough for a full batch) would work out just as well? Yes that should work fine, but the peels may lose a bit of their fragrance in the freezing process. Thank you for your site. I find it very helpful. I use this to mixture chase spiders away too. I spray around all the window and door openings (exterior only because it can stain flat interior paint), my porch/patio and all the corners of my garage as well as the rose beds. Works really well and is pet safe. Hi, Just a little FYI… I also love making my own natural sprays, cleaners and oil blends. I have cats and I’ve heard that citrus is not healthy to spray around them. I’m not 100% sure of the accuracy but I’ve heard it on many different platforms. Take good care! Dear Tori, I am based in Germany and I really love your site! 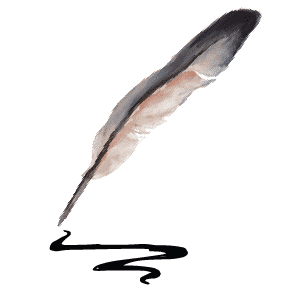 So many great ideas and articles. I will use this cleanser very soon. Thank you for building this lovely place in the web. Thank you for writing Nicole! I like your idea for all purpose homemade cleanser made of citrus peels! I have always wanted to use them, not just throw them away! You helped me to find the way! Thank you! Could this cleaner be used on laminate floors? Hi Erin, I don’t have laminate flooring but I read online that citrus oil products are not recommended and may damage the finish. 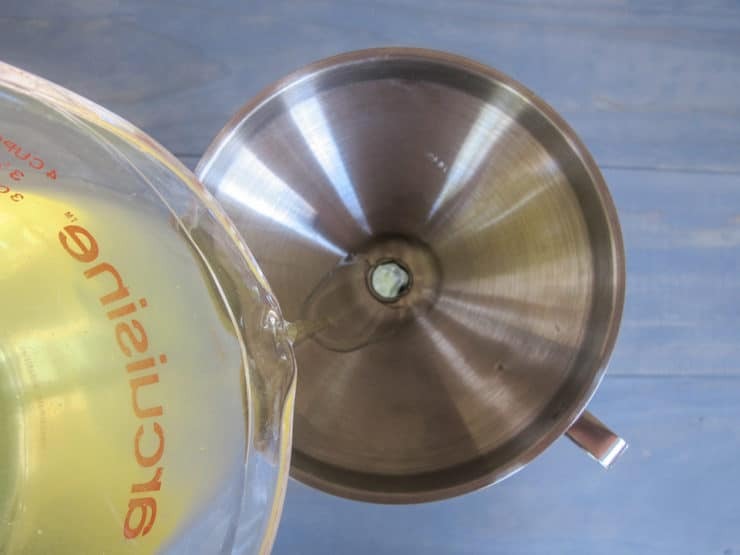 However vinegar is said to work well, so maybe just use the diluted vinegar without the citrus infusion? I’m not an expert here, just letting you know what I found online. Hi Debbie, you can freeze them until you’re ready to use them, then defrost before placing them in the vinegar. tori- this is TREMENDOUS thank u very much! my handicapped child has a very quirky sensory integration disorder on top of every thing else and we have been relegated to using only high acid (9%) white vinegar as a household cleanser. it’s ok for some stuff but not so much on others and the smaller bathrooms REEK OF VINEGAR for long periods of time after cleaning. i can’t wait to try this cuz i know she will NOT react to citrus and this stuff has to smell a lot better than straight vinegar. i also have a surfiet of “off” citrus still on all my trees. thank you SO MUCH!!!!! I’m so happy that it is helpful Laura! It smells worlds better than vinegar alone. Please let me know how you like it! I have seen similar recipes before but this is the first one that said not to get any of the fruit in it. I’m glad I hadn’t tried it yet! You are also the first to say a mixture of peels is OK. Thanks! You’re welcome Paula! Yes a mixture is totally fine. The color can turn out a bit strange due to the mix of colors, depending on which peels you use, but it will smell delicious and work equally well. Lemon-lime is lovely, as is orange-grapefruit. I love your recipes and your email newsletters. homemade cleaner for granite countertops, please? Thanks Lina! It’s really not a big deal, I’m feeling fine… just one of those weird things that I’ll have to keep tabs on. I appreciate the kind thoughts! I was given samples of orange and lemon essential oils. Perhaps those can be used in place of the fruit? I’m trying to figure out what to do with them since strong scents on my body send my brain into a tizzy. Thanks, Tori… I love homemade cleaners/ideas! Is it OK to use the peels from mandarins or tangerines? Barbara yes! Any citrus peel will do. 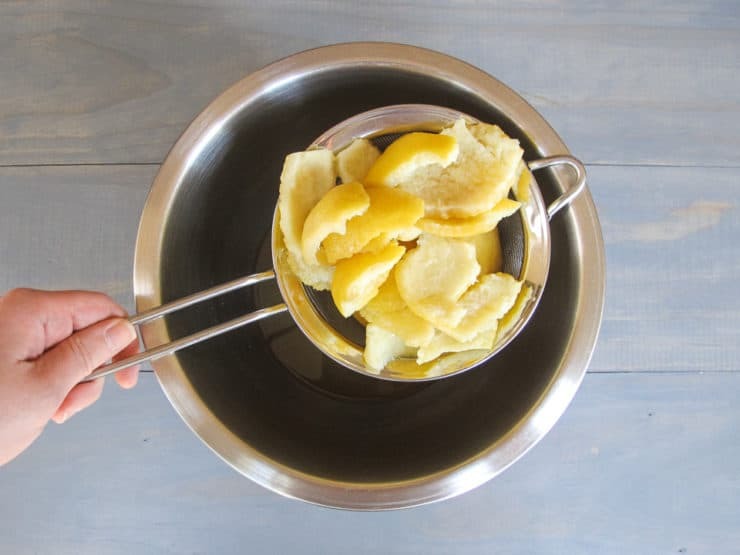 Just don’t let the actual fruit into the vinegar (only the peels), as it can cause parts that are exposed to spoil and the natural sugars can lead to stickiness. But yes, tangerines or mandarins will absolutely work. You never cease to amaze me with your knowledge! Thanks Tori!